One of our neighborhood's most fun traditions is back, with Wonderland's 13th Annual Sundress Fest. The fest, now taking up all of 11th Street and part of Kenyon, features BYO sundresses, or you can wear one of their own, and anyone wearing a sundress gets deals. The event also benefits the DC Central Kitchen, so it's a good time for a good cause. There's often bands, events, and food vendors too parked along the street. So You Want to Be a Philanthropist? Wonderland’s 12th annual Sundress Fest is calling. So you say you want to be a Philanthropist? Well, have we got a party for you, and all you need is a sundress and a sense of humor. If special occasions call for putting on your best dress, then the 13th annual Sundress Fest at The Wonderland Ballroom is certainly one of them! As we celebrate over a decade in the neighborhood, Wonderland invites both the young and old to come out on the first Sunday in May to support a local charity by putting on a sundress and celebrating life. We’ll have an all-day happy hour for ANYONE in a sundress. You can bring your own sundress, or get one at Wonderland. There will be racks of sundresses, and everyone will find a one that fits. This year we are raising funds for DC Central Kitchen, so c’mon, show a little leg. Situated on the corner of 11th and Kenyon St, NW, Wonderland became part of the neighborhood in 2004, back when the Columbia Height’s Metro stop was across from an empty lot. Now we’re on the southern goalpost of the neighborhood’s 11th Street strip, and a fine place for locals to find outdoor seating and familiar faces. But what’s so special about this place? We like to think it’s special because we have the nicest collection of Buddha’s and old signs anywhere in Columbia Heights. Or maybe it’s the dance parties upstairs. The 12 tap lines are cold, and the prices are right, so it could be that as well. But really we know it’s all the folks, the neighbors, the staff who hang out and get to know each other at Wonderland. Wonderland also prides itself on supporting local artists and community groups. The stage fills with trivia on Mondays, karaoke singers and DC Bocce players on Tuesdays, and live bands, comedy, and variety shows the rest of the week. DJ’s spin dance music way past midnight on the weekends. 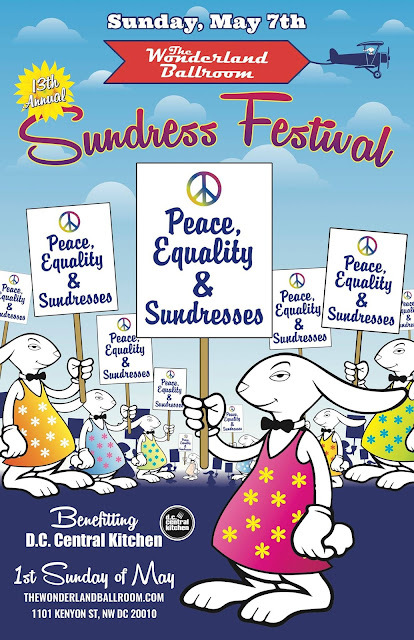 Please join us the first Sunday in May to help make our 13th Annual Sundress Fest a big one! Whether you wear your own dress or get one at Wonderland, attend this charity in style. (But remember: don’t wear the same dress two years in a row! ).